Just this morning, we reported that Ryan Murphy had backed down from his plan to dedicate a season of his American Crime Story anthology to Bill Clinton’s impeachment hearings and the Monica Lewinsky saga, realizing that it was “kind of gross” to tell Lewinsky’s story without her involvement, and now History has come to a similar decision. According to Variety, that network has also canceled plans for a Clinton impeachment drama, though it didn’t offer up a reasoning for its decision like Murphy did. History’s plan seemed a little questionable in the first place anyway, with the move to shine a new light on a Democratic president’s scandal looking like an overt attempt to distract from Donald Trump’s constant stream of White House scandals. 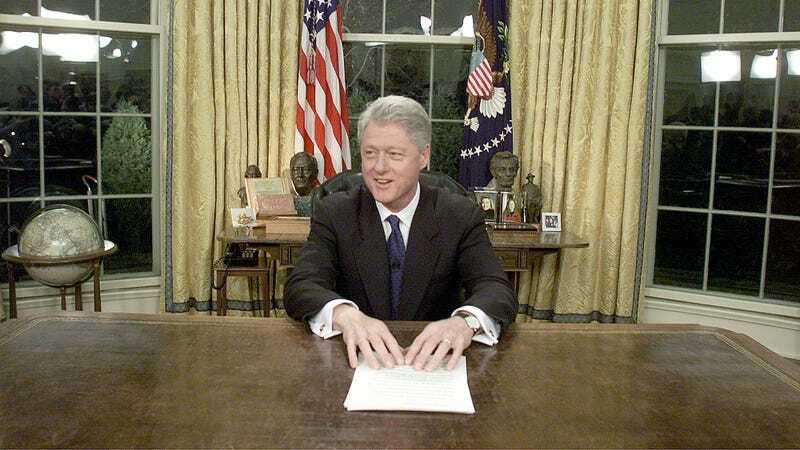 It would’ve been based on Peter Baker’s The Breach: Inside The Impeachment Of Bill Clinton, and History had already ordered six episodes back in September. It also would’ve been directed by If I Stay director R.J. Cutler, who said it was “the origin tale of how our government was broken and has never really healed”—implying that everything was perfect before Bill Clinton came along, which tells you all you need to know about what this show’s angle would’ve been.